Recently, we asked via our Twitter page, ‘What is the first World Cup you can remember?’ The response was staggering and much greater than we could have imagined. Indeed, one of the most common answers was the 1982 tournament in Spain. For many, that year's competition showcased football at its best - attacking, creative and of course with its fair share of controversy. It is a tournament which has led some critics to believe it to be the best of all-time. We thought it necessary, therefore to look closer at this memorable summer of football. So where to start? The group stage seems a safe bet...wait...there was two group stages in ‘82!? Here we go! The World Cup had grown in popularity considerably since its introduction in 1930. Until 1982 however, the tournament was limited to just 16 teams. 16 international sides hardly represented the growth and evolution of the game and sure enough, eight more teams were added to the group stages in Spain. This, of course, meant qualification was easier for certain nations, noticeably those in Europe, but also gave the chance on the international stage for smaller nations like Algeria, Cameroon, Honduras, Kuwait, and New Zealand to make their competitive debuts. Also featuring, for the first time since 1970, was '66 champions, England. In 1982, Britain was at war with Argentina over the Falkland Islands. Astoundingly, the conflict was to end just one day after the tournament's kick-off on the 13th June. Nevertheless, the lead up to the competition was dominated by the relationship between the conflicting nations and provided the possibility of either the qualified British nations (Northern Ireland, Scotland and England) or defending champions Argentina boycotting the finals. FIFA was firm in its stance on the warring nations and neither would leave the tournament. Let the groups begin! The 1982 tournament is full of remarkable stories and each group holds some of the World Cup's most intriguing spectacles. It only seems fair to look at each group one at a time. In Group 1, Poland and Italy would progress, with African newcomers Cameroon missing out on qualification via goal-difference. For the Italians however, the years in the run up to the tournament had been overshadowed by a match-fixing scandal (sound familiar?). Star striker Paolo Rossi had been banned for three years for his major role in the Totonero scandal - only to come back a year early to play for the Azzurri in Spain. Group 2 saw two-time champions West Germany in a what would appear to be a relatively comfortable group - Algeria, Austria and Chile would be their rivals for progression. First up came Algeria. The African debutants were expected to be brushed aside by Matthaus, Rummenigge et al. yet managed to defeat the Germans 2-1 in Gijon. The shock would rank alongside the greatest in World Cup history and show the world that African nations were here to stay. Defeat left the Germans on the edge of elimination and only a victory over all-but-qualified neighbours Austria would maintain their place in the tournament. What followed would become know as the 'Disgrace of Gijon' - A narrow 1-0 West German victory the day after Algeria's win over Chile meant both European nations would progress to the next round. The lack of effort and negative approach from both sides came under enormous scrutiny. German and Austrian commentators refused to comment on the game and the fans inside the stadium let their feelings known via chants of 'Out! Out!' as well as some in support of the Africans, Algeria. The full-time whistle was blown and West Germany would progress to the second group stage. The third and fourth groups saw less controversy, but plenty of goals. No game saw more than when Hungary faced El-Salvador in Elche. A 10-1 drubbing in favour of the Hungarians drew comparisons to the Magical Magyars of '54. Despite a record victory, the eastern-Europeans would struggle to compete thereafter with Euro '80 runners-up Belgium and Maradona's Argentina. In group 4 was England. 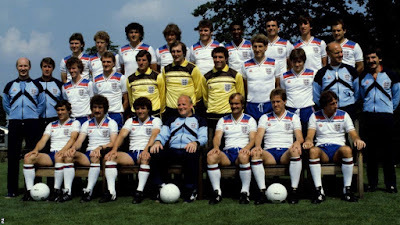 The English were keen to make an immediate impression in their first World Cup in 12 years and got off to the perfect start as Bryan Robson fired the Three Lions into a first-minute lead against France. A perfect group stage would follow and the English fans were dreaming. Group 5 would pit the hosts against Honduras, Yugoslavia and Northern Ireland. The Spanish were by no means offering a world-class team but an opening draw to minnows Honduras, hardly set the world alight. Despite a subsequent victory over Yugoslavia, defeat would be felt at the hands of Northern Ireland. The Northern Irish had boasted a squad filled with talent - the incredible Pat Jennings in goals, two-time European Cup winner Martin O'Neill and Manchester United forward Norman Whiteside. It should come as little shock then, that Gerry Armstrong's 47-minute goal in Valencia proved to be the difference. The final group saw the last British nation involved - Scotland. Scotland had been the only British representative in 1978 and despite some glorious football had crashed out agonisingly to the Netherlands. This time, they were determined not to head home early. With some genuine world-class individuals in the side, noticeably through the Liverpool-inspired spine, they had real hope. Despite an impressive 5-2 drubbing of New Zealand, a heavy defeat to one of the great Brazil sides meant that only victory over the Soviet Union would do. A 2-2 draw later would see further Scottish heartache at a major international tournament. Even a strong Scottish XI was no match for Socrates and co. Progression meant a second round of groups, each with three teams competing for a place in the semi-finals. Rather like the modern Nations League, the resulting fixtures were genuine high-class affairs. Despite this, Groups A and B saw the goals, which had littered the initial round of matches, dry up. Poland narrowly outscored the USSR to qualify before West Germany overcame the hosts and old enemies England to reach yet another World Cup semi-final. Goals returned in the remaining two groups - with France comfortably overcoming the Austrian and Norther Irish challenge. Prior to this - Group C has culminated in one of the sport's greatest ever encounters. Following victories over Argentina, both Italy and Brazil were level on points heading into the deciding match in Barcelona. The Brazilian team, in 1982, were widely regarded as one of the finest ever assembled. With superstars like Zico, Socrates and Falcao amongst their ranks, many expected the Selecao to win their 4th World Cup that year. The Italians however, were well drilled and boasted world-class players of their own. A Juventus dominated XI, with legendary goalkeeper Dino Zoff between the sticks, would be a match for anyone. 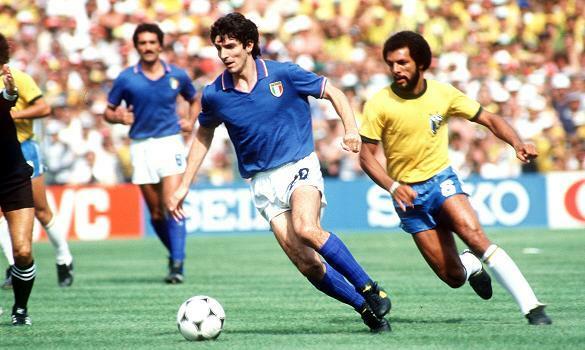 Paolo Rossi scored a dramatic hat-trick to win the game 3-2, as Brazilian defensive frailties were exposed for the first time in the tournament. These Football Times describe the Brazilian squad as possessing one of the most gifted, yet ultimately flawed midfields in football history. Tactical naivety, when it really mattered, was to be one of the game's most remarkable side's downfall. Italy would brush aside the challenge of the tournament's surprise package, Poland, in the semi-finals. Meeting them in the final would be either West Germany or Michel Platini's France. The match was one to remember, both for the incredible football played and the controversy surrounding German goalkeeper Harald Schumacher. In a sweltering Seville, early goals were traded and the score was locked at 1-1. In the second half, substitute Patrick Battison raced through on goal. The bouncing ball was knocked past Schumacher and open goal would surely follow. However, the goalkeeper took matters into his own hands...or hip, as he turned to heavily catch the Frenchman in the head. Battiston was knocked unconscious, losing two teeth and damaging vertebrae in the process. The ball would dribble wide and no foul was given. To make matters worse, after a pulsating extra-time period where four goals were exchanged, Schumacher would rub salt into French wounds and deny Didier Six and Maxime Bossis in the World Cup's first ever penalty-shootout. 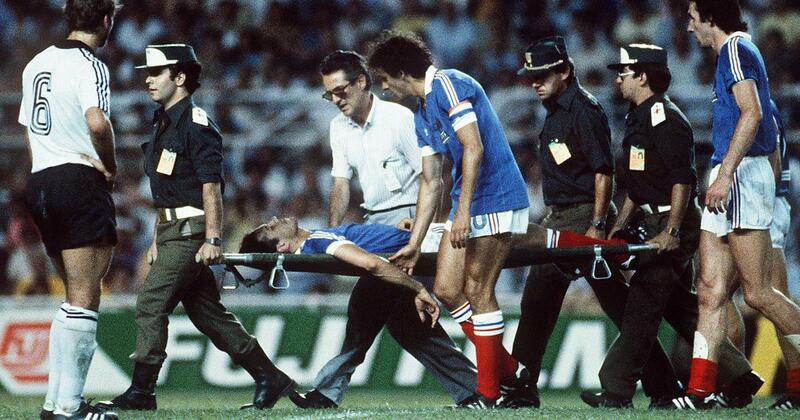 West Germany were in the final and France would be left to lick its painful wounds. The final saw the jaded Germans face off against a revitalised Italian machine. Defensively, the Italians were outstanding and combative nature would prove too powerful for their European neighbours. After Rossi's 57th-minute opener, the game's most memorable moment took place as Marco Tardelli flicked the ball onto his left foot and unleashed a powerful drive past the flat-footed Schumacher. The goal was good, but the celebrations were on another level. The pure emotion etched on Tardelli's face was a sight to behold as decades of Italian World Cup frustration was all but forgotten. 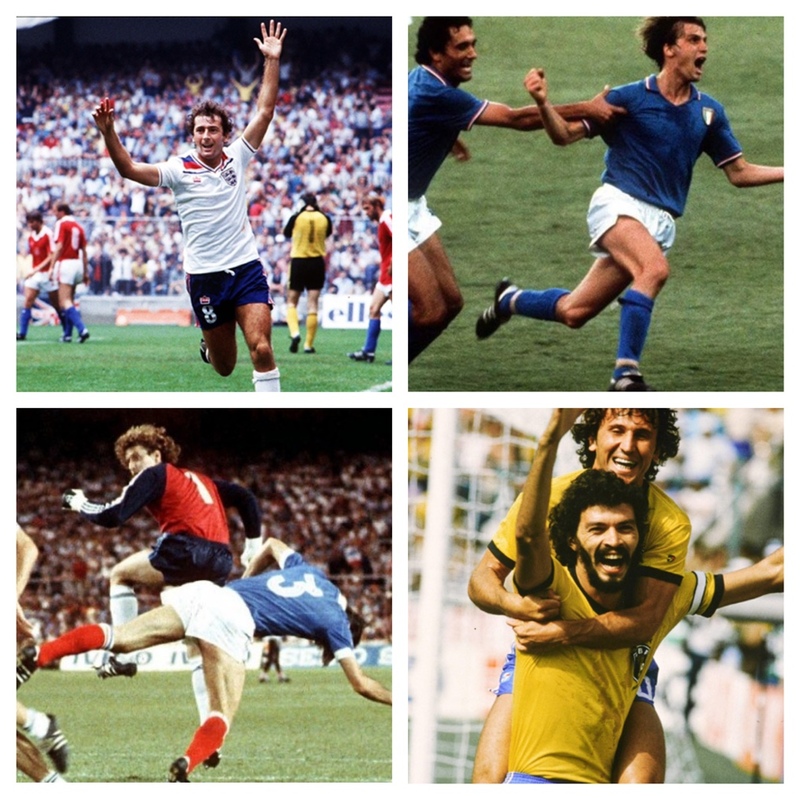 West Germany's Paul Breitner would add a consolation after Italy's third, but it was too little too late. The World Cup was over. Italy were champions once again. So why write about the 1982 World Cup? For many critics, the tournament in Spain was perhaps the greatest ever. It has left a strong legacy on many fronts. Firstly, the tournament was the first to feature 24-teams. It was a dramatic move by FIFA to increase the number of competing nations, but ultimately it proved to be a shrewd one. This would, of course, help the confederation in its eventual growth to 32, and soon, 48 teams. The Algerian victory over West Germany and the positive performances by minnows Honduras and Cameroon showed that the game was truly global and not confined to Europe and South America. The Disgrace of Gijon would mean that deciding group matches would be played at the same kick-off time in future tournaments to rid the opportunity for farce and corruption. Above all however, was the football. The 1982 edition of sport's greatest prize, showcased the beautiful game at its most beautiful. Goals were found in abundance and future World Cup's would learn from its glorious example. The best ever? You decide!